The 2012 The Planning & Scheduling Awards held at The Brewery, London were a great success (who said you can’t organise a party at a brewery…?). These awards were very much the initiative of David Tyerman, Managing Director of Athena Project Services, he deserves congratulations for the initiative and here’s looking forward to the 2nd annual awards in 2013. Maybe in 2013 the awards will start to become international?? Great job, great outcome, congratulations to the supporting organisations and every participant – we need more of this type of event world-wide. Whilst the UK is a long way from Australia, I’m starting to think it may be well worth the travel to attend the next event in 2013. At times I’m pleased we only have to support our Stakeholder Circle software. The following was forwarded by a colleague – the veracity of the conversation cannot be determined! Caller : Hi, our printer is not working.. Customer Service: Mouse? 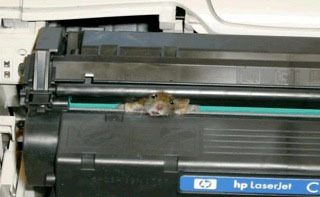 … Printers don’t have a mouse!!! Caller: Mmmmm??.. Oh really? .. I will send a picture. I have just finished writing short one sentence abstracts for the PMOz program sheet that’s part of the delegate pack. I have to say there is are going to be many difficult choices of the best paper to attend across the three primary streams of Methodologies and certifications, Planning and controls and Projects in Organisations and that’s before taking into account the ISSEC papers PMOz delegates can attend if they so choose. Its not too late to book your attendance at what is likely to be one of the best project management conferences this year. I cannot think of a better way to earn PDUs, learn new things and have some serious fun! The PMOz dates are 14th to 16th August and the place to be is: Sebel and Citgate Albert Park, Melbourne. I look forward to seeing you at the ‘Welcome Reception’ on the 14th; for more information see: http://www.pmoz.com.au. Projects struggling for management support are one of the key indicators of a sub-standard value creation system that is failing to make full use of the deliverables created by projects and programs. But the problem is likely to be much deeper; surveys consistently show that between 15% and 80% of projects undertaken by organisations cannot be linked to the performing organisations strategy. These ‘ferrel projects’ are either symptoms of inadequate governance, or symptoms of inadequate strategic planning! Over the last few years, Portfolio Management has started to emerge. Portfolio management should have a strategic focus and make selections based on strategic priorities but in most current implementations tends to be a process oriented, stand alone function. Certainly by applying capacity constraints the number of projects that fail due to lack of organisational resources will be reduced but the focus on value creation is minimal. Management support and organisational change are not central to the process. There is literally a ‘fence’ between the executive ‘strategic planning’ processes and innovation within the organisation. Most authorities describe project and programs as the ‘change agent’ responsible for creating the ability to implement strategic initiatives to grow and improve the organisation. For this to occur, the strategic planning system needs to be far more engaged with the organisation and central to the process of innovation, guided and supported by the organisations executive! However, my feeling is there is a tactical level missing from strategic thinking that will be needed for this process to work effectively. The overarching ‘strategic guidance’ needs to be fairly stable and take a long view and only be updated as needed (possibly twice a year). Based on this strategic guidance, a detailed strategic plan is developed at a ‘tactical level’, to frame the current implementation of the strategy. This process needs more rigour and more flexibility (the two are not mutually exclusive) compared to the high level plan, should only take a medium term view and be updated continuously. Based on this plan, feasible ideas that support the strategy are authorised for the development of a value oriented business case. The creation of this flexible but rigorous tactical-level strategic process would place the ‘plan’ at the forefront of processes such as Portfolio Management and virtually eliminate ferrel projects. 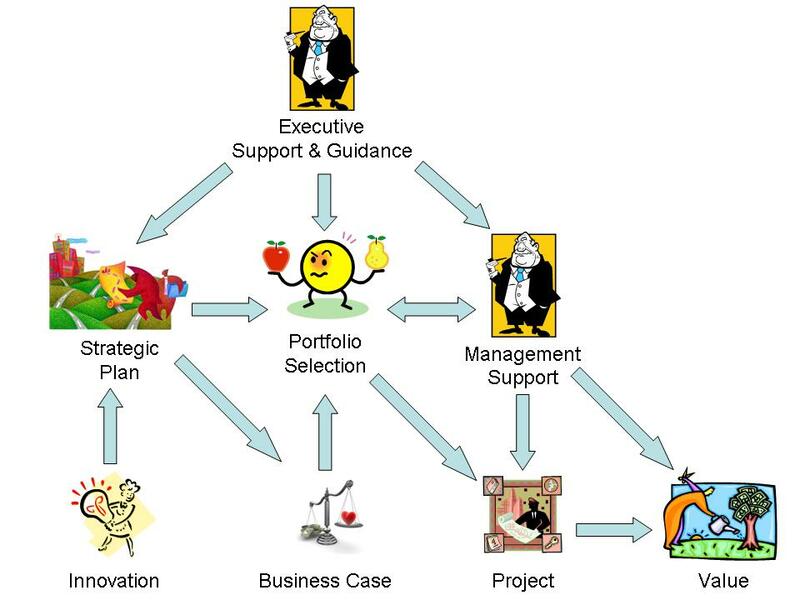 Portfolio management also has a central role to play in developing strategy. The current strategy informs the portfolio selection process, and information on current projects and programs, the viability of assessed business cases and other consolidated information is absorbed back into the strategic planning process. 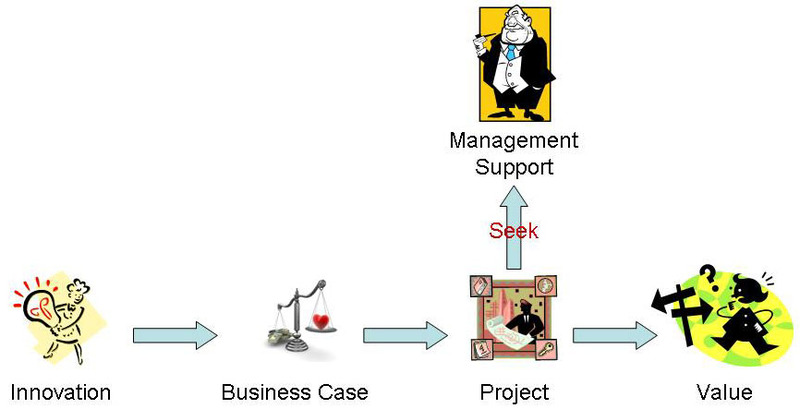 Based on these factors, the key job of the portfolio managers is to select the most strategically important business cases, within the capability and capacity limitations of the organisation, for initiation as projects or programs, and cancel or modify projects that no longer align with the evolving strategic plan. Strategic planning also needs to evolve from a fluffy ‘high level’ process to a far more useful function that actually sets the strategy for the organisation’s management to implement. Within this framework, the organisations governance systems and leadership need to ensure their management support the process and are focused on creating value. Most of the work needed to make this process work is in management areas outside of the traditional Portfolio, Program and Project management (PPP) arena. But no organisation will achieve the optimum results from its PPP initiatives without the front and back ends of the overall value chain being of equal ‘strength’. This is not rocket science, many successful organisations, particularly in mining and engineering achieve this type of integration in their core business. For more on the governance aspects see: Mosaic WP1073 – Project Governance. For more on the overall project delivery capability see: Mosaic WP1079 – Project Delivery Capability. The last couple of months have seen the publication of two books designed to provide a practical foundation for people wanting to understand the basic ‘mechanics of scheduling’. Murray Woolf published his CPM Mechanics, available from http://www.cpmmechanics.com and Aldo Matos published Planejamento E Controle De Obras, written in Portuguese, the book is available from http://construcao-engenharia-arquitetura.lojapini.com.br/pini/vitrines/produtos/produto3634.asp. Both books are aimed at a similar market niche; working schedulers who have realised that understanding what their software actually does from the perspective of computational mechanics (to use Murray’s term), is essential for the creation and maintenance of effective schedules. Simply being able ‘push the right buttons’ to drive scheduling software without understanding why the different functions exist is similar to being able to drive a car without being able to read a map and plan a route. The mechanical skills for driving the ‘hardware’ are only useful if you know exactly where you want to go! Once you have learned to ‘map read’ you can plan to go virtually anywhere and understand the potential challenges of the journey before you start. The scope of Aldo’s book is wider, including sections on Line of Balance, Activity on Arrow, and balancing time and cost. With very limited Portuguese much of the text was beyond my reach but anyone working in Brazil, Portugal, East Timor, etc., I would certainly recommend this book as a valuable resource for understanding the technical aspects of the art of scheduling. Murray’s book is true to its title and concentrates on the mechanics of CPM scheduling in Precedence networks. As with his other books, it is thorough and detailed, contributing another component to the library of scheduling books Murray has planned for publication. Many of the more established tomes such as James O’Brien’s CPM In Construction Management (6th Ed. By Fred Plotnick & Jim O’Brien) are targeted at experienced practitioners and are both expensive and wide ranging. By focusing on a specific and important skills development niche; both of the books discussed in this post are effective, affordable and useful to schedulers seeking to advance their careers and move from knowing what their software does to understand precisely why their software produces the results is does, and importantly be able to recognise any software induced errors. Fortunately the language difference allows me to avoids the difficult job of determining which is ‘best’ and I’m happy to recommend both books – chose the one that ‘speaks to you’. Effective project and program governance requires a carefully measured balance between prudent and effective risk taking, allowing skilled project teams the flexibility to tailor and improve processes to enhance success and effective surveillance to ensure the organisation’s objectives are being achieved. The interaction between dependent or connected risk and independent risk is interesting and will significantly change the overall probability of success or failure of an endeavour or organisation. As discussed in my last post on ‘The Flaw of Averages’ using a single average value for an uncertainty is a recipe for disaster. But there is a difference between averaging, connecting and combining uncertainties (or risk). Where risk events are connected, the ability to model and appreciate the effect of the risk events interacting with each other is difficult. In ‘The Flaw of Averages’ Sam Shaw uses the simile of wobbling a step ladder to determine the uncertainty of how safe the ladder is to climb. 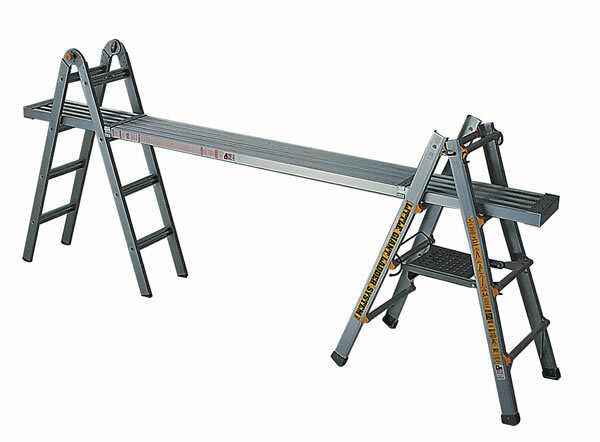 You can test the stability of one ladder by giving it a good ‘wobble’. However, if you are trying to determine the stability of a plank between two stepladders doubling the information from wobbling just one is not a lot of help. Far more sophisticated modelling is needed and even then you cannot be certain the full set of potential interactions is correctly combined in the model. The more complex the interactions between uncertainties, the less accurate the predictive model. However, when the risks or uncertainties are independent, combining the risks through the creation of a portfolio of uncertainties reduces the overall uncertainty quite dramatically. Consider a totally unbiased dice, any one throw can end up anywhere and every value between 1 & 6 has an equal probability of being achieved. The more throws, the more even the results for each possibility and consequently there is no possibility of determining the outcome! 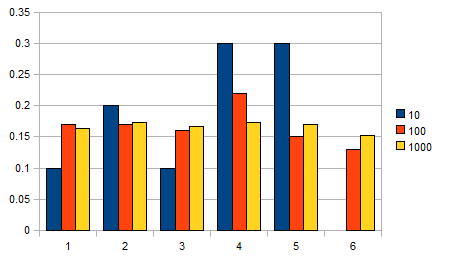 The distribution after 10, 100 and 1000 throws. As the number of throws increase, the early distortions apparent after 10 throws smooth out and after 1000 throws the probabilities are almost equal. However, combine two dice and total the score results in a very different outcome. Whilst it is possible to throw any value between 2 & 12, the probability of achieving a number nearer the middle of the range is much higher than the probability of achieving a 2 or a 12. The potential range of outcomes starts to approximate a ‘normal distribution curve’ (or a bell curve). The reason for this is there is only one combination of numbers that will produce a 2 or a 12; there are significantly more combinations that can make 7. The more dice you add to the ‘throw’, the closer the curve becomes to a ‘normal distribution’ (or bell curve), which is normally what you expect/get, which is the origin of the name! Each project carries its level of uncertainty and has a probability of succeeding off-set by a probability of failing (see Stakeholder Risk Tolerance) but as more projects are added the probability of the overall portfolio performing more or less as expected increases, provided each of the uncertainties are independent! This effect is known as the Central Limit Theorem. One important effect of the Central Limit Theorem is the size if the contingency needed to achieve a desired level of safety for a portfolio of projects is much smaller than the sum of the contingencies needed to achieve the same level of ‘safety’ in each of the individual projects. Risk management is a project centric process; contingency management is better managed at the portfolio level. Not only is the overall uncertainty reduced, but the portfolio manager can offset losses in one project against gains in another. Whist this theorem is statistically valuable, the nature of most organisations constrains the potential benefit. From a statistical perspective diversity is the key; this is why most conservative investment portfolios are diversified. However, project portfolios tend to be concentrated in the area of expertise of the organisation which removes some of the randomness needed for the Central Limit Theorem to have its full effect. It is also important to remember that whilst creating a portfolio will reduce uncertainty, no portfolio can remove all uncertainty. In addition to the residual risk of failure inherent in every project, there is always the possibility of a ‘black swan’ lurking in the future. Originally conceptualized by philosopher Karl Popper and refined by N. N. Taleb, a ‘black swan’ is a risk event that has never occurred before, if it did occur would have and extreme impact and is easy to explain after the event, but is culturally impossible to predict in advance (ie, the event could be foreseen if someone is asked to think about it but it is nearly impossible to think the thought for a compelling reason). For more on black swans see our blog post and White Paper. The Central Limit Theorem is closely aligned to The Law of Averages. The Law of Averages states that if you repeatedly take the average of the same type of uncertain number the average of the samples will converge to a single result, the true average of the uncertain number. However, as the ‘flaw of averages’ has demonstrated, this does not mean you can replace every uncertainty with an average value and some uncertain numbers never converge. Both the Law of Averages and Central Limit Theorem are useful concepts; they are the statistical equivalent of the adage “don’t put all your eggs in one basket”. When you create a portfolio of projects, the average probability of any one project succeeding or failing remains the same as if the project was excluded from the portfolio, but the risk of portfolio suffering an overall failure becomes less as the number of projects included in the portfolio increases. However, unlike physical laws such as gravity, these laws are not immutable – drop an apple within the earths gravitational pull and it will fall; create a portfolio and there is always a low probability that the results will not conform to normal expectations! Certainly the probability of a portfolio of projects ‘failing’ is lower then the average probability of each project failing but a reduced level of risk still leaves a residual level of risk.